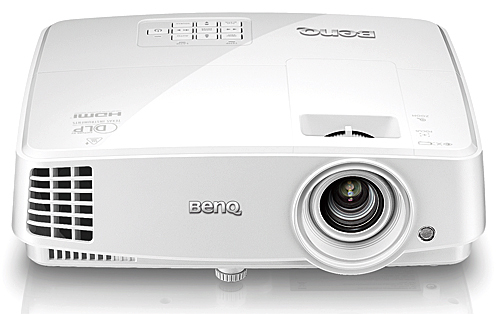 The BenQ MH530, at $599, is listed as a home entertainment projector, but it's actually an inexpensive crossover model for home, office, and classroom. In addition to offering full 3D support and a fast lag time for gaming--two features of interest for home use--it also offers solid classroom functionality, including two VGA ports, a monitor-out port, and built-in teaching templates that project guides to help write text in straight lines on a blackboard or whiteboard. Beyond that, its native 1920x1080 resolution is ideal for presentations with fine detail as well as for HD video. And with a 3200-lumen rating, the MH530 is bright enough to stand up to ambient light with a suitably large image for a small-to-mid size family room, conference room, or classroom. Color Preset Modes. The MH530 has four customizable color preset modes--Dynamic, Presentation, sRGB, and Cinema--and two User modes. As with most projectors, the brightest mode--Dynamic--sacrifices color quality for brightness. It's also the only preset whose color balance is a little off, with brown or yellow tints at various shades of gray. For video and photos, Dynamic mode also tends to posterize brightly-lit faces, losing the subtle shading that gives them a photo-realistic look. Presentation, sRGB, and Cinema all offer good color quality or better, with Cinema the best of the three. For our Video Optimized settings, we started with Cinema mode, turned off Brilliant Color and tweaked the levels for individual colors, winding up with near-excellent color quality. For data images like business presentations, all four modes offer nicely saturated color. In Dynamic mode, however, some colors look notably dark, off hue, or both. Presentation offers the highest brightness with suitably eye-catching color. For our Presentation Optimized settings, we improved color a bit by adjusting the mode's Color Temperature. Data Presentations. The MH530 doesn't hold fine detail as well as the best 1080p models, but it comes close. White text on black, for example, was easily readable at 7 points in my tests, and black text on white was easily readable at 4.5 points. If you happen to be using a VGA connection, the projector does a good job of resisting most pixel jitter and moire patterns with images that tend to cause them. In my tests, it introduced a little of each in images with patterned fills using closely spaced lines or dots. If you see either problem, however, you can eliminate it by using an HDMI connection instead. 2D Video. The test unit did an excellent job of avoiding posterization and holding shadow detail. I saw some moderately obvious noise in test clips that tend to show noise, but not enough to consider it a problem. The contrast ratio is low enough so colors look a little flat in theater-dark lighting, but they look fine with lights on, where the benefit of a higher contrast ratio gets compromised by the ambient light. Full 3D Video. The MH530 offers essentially the same quality for 3D as 2D for those aspects of quality that the two share. It also does well on 3D-specific issues. I didn't see any crosstalk and saw only the typical minor levels of 3D-related motion artifacts and loss of brightness. There's only one 3D color preset, but you can tweak it by adjusting red, green, and blue individually for hue, saturation, and brightness. Rainbow artifacts shouldn't be an issue for most people. With data images, I saw them only with one test image that's designed to bring them out. With video, I saw them rarely enough with well-lit test clips and in an evening of TV-watching that few people, if any, would find them bothersome. The only times they showed often enough that someone might find them annoying was in a black-and-white test clip and a dark scene in a color clip. If you don't watch much black and white material, they aren't likely to be a problem.